You don't need to be a math whiz to enjoy a great sudoku puzzle! Sharpen your mind and have some fun with this great collection of sudokus, including over 540 challenges across four difficulty levels (Warm Up, Challenging, Tough, and the ultimate Samurai Sudoku!) A must-have for all Sudoku enthusiasts. OVER 500 PUZZLES & SOLUTIONS: Hours of fun and entertainment to enjoy! VARIETY OF LEVELS: From levels 1 to 3 increasing levels of difficulty including Warm Up, Challenging and Tough. When you are done, test your skiills on the ultimate Samurai Sudoku Puzzle - 5 puzzles linked together by a central puzzle! Can you become a master samurai? LAY FLAT: Spiral bound lays flat for ease of use at home or on the go. Whether your drinking your morning coffee, riding on the train or relaxing on vacation this sudoku book can go with you. MAKES A GREAT GIFT: For the sudoku puzzle lover, this books makes a great gift for any occasion! Birthday, stocking suffer, roadtrip or more, everyone will love it! PARRAGON PUZZLE BOOK COLLECTION: Look for additional puzzle books from Parragon for all types of puzzles including crosswords, wordsearches, and more! 2,000 PUZZLES & FULL SOLUTIONS: This is truly a sudoku book like no other. With 2,000 puzzles inside, it is guaranteed to provide you with hundreds of hours of fun. FOR ADULTS & KIDS: Puzzles are appropriate for both kids and adults alike! 5 DIFFICULTY LEVELS: Whether you are a pro or just starting to play sudoku puzzles, you will find an appropriate challenge level in this book. Each of the 5 levels, from EASY to EXTREMELY HARD has 400 puzzles. EASY-TO-READ FONT: Puzzles are in size 18 font, so that you will never suffer from eye-strain while doing them. PRINTED ON HIGH-QUALITY PAPER: Puzzles are printed on 60-pound high quality white paper so you can use pencils or pens without worry of bleed-through. KEEPS YOUR MIND HEALTHY: Sudoku puzzles are a proven method for keeping the mind healthy and combating Alzheimer's and Dementia. A GIFT LIKE NO OTHER: If someone in your life loves sudoku puzzles, you won't find a more unique and substantial gift than this book. VOLUME 2 ALSO AVAILABLE: This is the 1st volume of the best selling series "The Largest Sudoku Book in the History of the Universe". Check out Volume 2, also available on Amazon now! Can't get enough of Sudoku? This book is for you! It contains three hundred challenging and devilishly difficult Sudoku puzzles in a portable paperback. This book contains 512 SUDOKU puzzles of varying difficulty, meant to take you to a journey of discovery and eventually mastery of this century’s most addictive game. There are plenty of puzzles for you to enjoy: There are 128 EASY, 128 MEDIUM, 128 HARD and 128 EXTREME puzzles, if you want a real challenge. Whatever you´re looking for, there´s something for you in this Sudoku Book. Good luck and play! Keep your brain fit, young, and flexible! Each puzzle has one solution - provided at the back of the book. Extra wide center marginsmake it easier to solve the puzzles when you fold the book back, or if you want to tear out the pages. Take a break, relax, and do a little puzzling. Sudoku puzzles are fun and engaging, while providing your brain a little stimulation! These puzzles have been selected with relaxation in mind. They provide a fun challenge without being too difficult. 161 total puzzles. Watch out! These Sudoku puzzles are not for the faint of heart! But if you dare, grab a pen and take on these two hundred all-new extra-challenging puzzles. 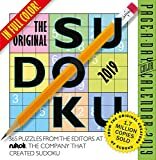 The original Sudoku calendar is more than just a year of Sudoku—it’s the best year of Sudoku with puzzles that are handcrafted by the experts at Nikoli, the Japanese creators of the game. Each of the more than 300 full-color, brain-boosting puzzles is crafted by hand, providing a level of utterly absorbing and addictive fun that computer-generated puzzles just can’t match. Every weekend starts off with a simple puzzle to ease you in; then, as the week continues, the puzzles get increasingly difficult, encouraging you to kick up your problem-solving skills as you go. A perfect gift or desk activity for puzzle enthusiasts.